"There are very few things that serve such a great form and function, and look cool," said Daniel Chandler, 26, an AR-15 owner here in suburban Maryland. When he takes his AR out of its case at a shooting range, he smiles like he just unwrapped a gift. "There are few things you'll find that are wonderfully appealing to look at, wonderful exercises in mechanical engineering, and that could save your life." This is the side of the AR-15 that many don't see, or ever consider. Because an AR-15, or a variant, was used in several mass shootings — including Aurora,Colorado; Newtown,Connecticut; San Bernardino,California; Sutherland Springs, Texas; and Las Vegas, in which a total of 137 people were killed — this civilian sibling of a military assault rifle is an exceptionally polarizing product of modern American industry. The AR-15 and its semiautomatic cousins — they shoot one round for each pull of the trigger ─incite repulsion among those who see them as excessive, grotesque and having no place on the civilian market. It is the focus of multiple attempts at prohibition, which in turn has prompted people to run out and buy more. Such "panic buying" drove sales of AR-15s to record levels during the presidency of Barack Obama and the 2016 presidential campaign. Gun merchants say some buyers are also driven by a fascination with a weapon used in notoriously heinous crimes. Fears of a ban have subsided under gun-friendly President Donald Trump, and so have sales; gun makers are in the midst of a year-long slump that has driven down prices for AR-style rifles. Those discounts appear to have drivena record number of Black Friday gun background checks. Devotees say the AR-15 has been wrongly demonized, arguing that the vast majority of owners never use it in a crime, and that despite the rifle's use in mass shootings, it is responsible for a very small proportion of the country's gun violence. Thanks to that ardent following, and shrewd marketing, the AR-15 remains a jewel of the gun industry, the country's most popular rifle, irreversibly lodged into American culture. The civilian model wasn't mass produced until the 1980s, after the original patent expired and a variety of companies began making them. That transformed a specific brand to a more generic offering on which a mini-industry would flourish. The AR-15 and other semiautomatic rifles also turned up in shootings, fueling a movement to restrict their manufacture and sale. Much of the outrage stemmed from the militaristic appearance of those guns, and their ability to fire rapidly. "The higher muzzle-velocity projectiles, if they strike an organ, you're more likely to have severe injury and bleeding and dying than with lower muzzle-velocity munitions," said Donald Jenkins, a trauma surgeon at the University of Texas in San Antonio and the owner of several guns, including an AR-15. The backlash peaked in 1994, when President Bill Clinton signeda ban on the sale of many types of semiautomatic rifles deemed "assault weapons," including versions of the AR-15. Manufacturers continued making versions of the AR-15 that complied with the new law, which was allowed to expire in 2004. That set the stage for an explosion in AR-15 sales. "It's kind of the standard, de-facto rifle now," said Evan Daire, 23, a gun-range worker in New Jersey who aspires to become a professional target shooter. "No matter what role you're looking at, it pretty much fills that role." Today, one of out of every five firearms purchased in this country is an AR-style rifle, according to a NSSF estimate. Americans nowown an estimated 15 million AR-15s, gun groups say. New AR-15 style guns range widely in price, from about $500 to more than $2,000. When he turned 21 and began shopping, Maryland tightened laws in response to the December 2012 mass shooting at Sandy Hook Elementary School in Newtown, Connecticut. That measure banned many types of semiautomatic rifles, so when Chandler eventually decided that he wanted an AR-15, he built one from scratch, adhering to the new restrictions. It's black and green, with a 16-inch barrel, a collapsible stock and an electronic red-dot sight. "It was destined to be a best-seller because of these qualities," said Dave Kopel, a gun-rights advocate and research director at the Independence Institute, a libertarian think tank in Denver. Chandler loves the AR he built. He admires its simple, efficient mechanics, its precision, and how much fun it brings. He fires almost weekly for target practice, along with a Glock 17 handgun. He's taken his wife to the range with him, and she's become an AR fan herself, preparing to build her own. "The AR-15 makes sense, and I think that's why more people my age are gravitating to it," Chandler said. The hashtag #ar15 has over 1.7 million tags on Instagram, with users uploading by the minute. Gun makers have goosed sales by emphasizing the AR-15s connection to the military and the fight to defend one's freedoms, an argument that grew more effective during movements to ban them. The families of people killed in Newtown cited industry marketing techniques in a pending lawsuit against Remington, the maker of the killer's AR-style rifle. Gun groups say the company can't be held responsible, arguing that "millions of peaceful, law abiding Americans" regularly shoot ARs at the range with no ill effect. AR-15 owners say the rifle gets unfairly targeted by the actions of individual criminals, and that a ban wouldn't do much to affect gun violence. "If someone wants to do damage they're going to find a way," said Heidi Rapach, a mother of two from New Jersey whose husband, a police officer, taught her to shoot an AR-15 ­─ and bought her one for Mother's Day. "That doesn't mean guns themselves are the enemy. It's the person. It doesn't mean all the people that own guns and use them properly have to suffer for that." Crime rates in America havedeclined drastically during that period. Even so, AR-15s and similar guns are still used in mass shootings, drawing new rounds of condemnation — and calls for new bans — with each attack. Gun industry surveys assert that the typical AR-15 owner isa married man over 35, with a large proportion having served in the military or law enforcement. But this appears to be changing. New buyers tend to be younger and more diversethan the general gun-buying public, according to a 2017 report published by Southwick Associates, a market research firm, and the National Shooting Sports Foundation. That also includes women. Megan Hill's relationship with guns goes back as far as she can remember; her parents and grandfather kept firearms in their Southern California homes, and an early boyfriend took her hunting and target shooting. But it wasn't until she married, moved to Utah and was preparing to have children that she decided to get her own. "We looked at the AR-15, and it was all in one package," Hill, 26, recalled. "You can target-shoot with it, protect yourself with it, hunt with it. Luckily we haven't had to use it in self-defense, but it's a comfort knowing that it's there to protect my children and my family." Her husband ordered parts and built one himself. They've since acquired a few more. "It gave me a sense of myself again: I'm going to make this goal, I'm going to accomplish something," Hill said. 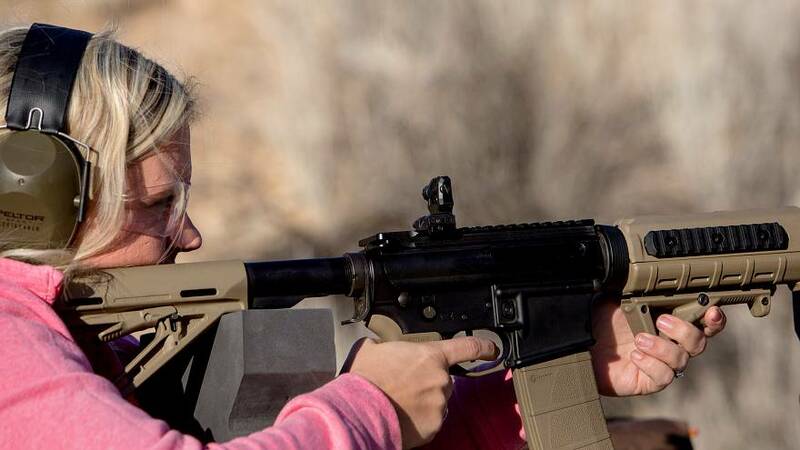 For Hill, life with an AR-15 can best be described in one word: freedom. She means both personal freedom and a symbolic freedom that connects her to the gun's use by the U.S. military. "What makes us a strong nation is our freedom, and the AR-15 represents that freedom," Hill said. Born into a hunting family in the San Francisco Bay Area, Ploshay has two ARs designed for killing game. One has a long barrel for use on varmints: coyotes, bobcats and foxes. The other has a shorter barrel that he takes out on long excursions into the brush, where he hunts for wild pigs. He can change calibers according to the size of the game he's pursuing. He hosts Facebook and Instagram pages dedicated to hunting in a state with tight firearm regulations. Ploshay, 25, a pipe fitter, said he relies on the ARs because of their precision, which allows him to deliver a single, deadly shot that minimizes the animal's suffering. "Once I started using it, I fell in love with how easy and accurate and light-recoiling it was," he said. Pinkston sometimes brings paying guests on night expeditions, outfitting them with AR-15s accessorized with top-of-the-line gear, not too different from what he used in the service. Using such a gun gives ordinary people a chance to "scratch that tactical itch," he said. That Walter Mitty-esque experience, he believes, plays a crucial role in the AR's enduring allure. "There's something about how guys are made that makes it appeal to them very much," Pinkston said. "I think it has something to do with wanting to be a soldier or law enforcement. There's something there, dream-wise."